Chile and Brazil put on a remarkable show to kick off the knockout stage, particularly in a breathless first half. On the balance of play Brazil probably deserved to advance, but Chile stuck with them throughout a feisty game and were the team denied a winner in the final minute of extra time by the crossbar. Chile employed the same 3-4-1-2 they used against Spain and the Netherlands, eventually slotting different personnel into the same system. When Felipe Gutiérrez replaced Eduardo Vargas at 54′, Vidal moved into the striker’s role alongside Alexis Sánchez with Gutiérrez playing underneath them. Just before the end of regulation, Vidal was replaced by striker Mauricio Pinilla (that’s Pineeya, Ian Darke, not Paneeja). When José Rojas replaced Gary Medel after the start of the second period of extra time (both he and Vidal were playing short of full fitness, the only reason either were subbed), Rojas played as the left center-back, with Gonzalo Jara moving to the middle. 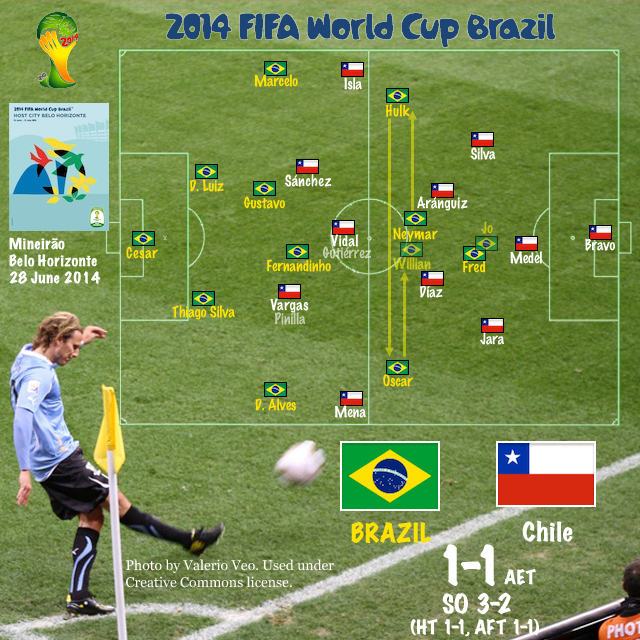 Brazil maintained Felipe Scolari’s favored 4-2-3-1, albeit with some important changes in personnel and positioning. After three lackluster performances, Paulinho was dropped in favor of Manchester City’s Fernandinho, and Scolari again juggled his trio of attacking midfielders, keeping Neymar in the middle but moving Oscar right and Hulk left, in effect returning them to the positions they played in the opening match against Croatia. At the start of the second period of extra time, Willian replaced Oscar and took up the central role, with Neymar moving left and Hulk switching to the right. Gary Medel (Chi) – Along with goalkeeper Claudio Bravo, Medel was a beast in defense for Chile. Despite being only 5’7″, he had a perfect record on his headed clearances and even won half of his six aerial duals. His best moment probably came at 39′, when a quickly-taken free kick by Oscar found Neymar in behind Chile’s defense. He simply stopped Neymar’s progress, and though the ball slipped through to Fred, enough time had elapsed for Jara to get back and deflect the shot. Through the periods of Brazilian dominance in the opening 30′ of the game, from 60′-80′, and throughout the first period of extra time, Medel kept his team in the game. Alexis Sánchez (Chi) – At the other end, Sánchez was easily Chile’s most dangerous player today. He combined well with Vidal in the first half, working down the right flank and attacking the space behind Marcelo. In the second half, he switched to attacking the left in order to accommodate Vidal to his right, and though less effective remained Chile’s brightest option throughout the game. If Sánchez is leaving Barcelona, he has placed himself nicely in the shop window this World Cup. Hulk (Bra) – Brazil’s best offensive performers in the first half were the more expected Neymar and Oscar (the latter only really putting his mark on the attack from about 30′ on, as Brazil’s attack shifted from a Neymar alone on the left flank to the pair attacking from the right). But the second half and extra time belonged to Hulk. He had a remarkable cross for the still unconvincing Jô at 74′, a wonderful solo dribble into the penalty box to create his own shot at 83′, and a stinging long-range shot at 103′–the best such shot of the game until Pinilla’s 120′ scorcher. While Fred and Jô continue to disappoint, Hulk’s performance justified Scolari’s faith in the striker. Fernandinho (Bra) – Fernandinho’s introduction into the team coincided with Brazil’s first truly fluent play in the tournament. It was difficult for me to determine to what degree he was responsible for that change, but there’s no question that Fernandinho brings a grit otherwise lacking in the Brazilian midfield (though one should not discount the defensive work that both Oscar and Ramires can put in, when called on). With the loss of Scolari’s favorite defensive midfielder, Luiz Gustavo, in the quarterfinal, Fernandinho is all but assured of a starting spot in the next game. It will be interesting to see whom he is partnered with, and how they perform the double pivot role. Brazil won the coin toss, and then they won the coin toss. Stupid Americans may love shoot-outs, but stoopid Americans know better. On the other hand, we do love us some Charles Aránguiz action. Nice take, Garth. I wish Chile had been able to extend into the extra time the effort they put into the second half; they might have had more than just the thumped crossbar to show for it. Sánchez and Medel were, as you pointed out, beasts. Thanks, Neil. Given the intensity of Chile’s press and the heat in Belo Horizonte, it’s probably not too surprising that they flagged. They were pressing non-stop for four games against (notwithstanding Austrailia) some of the best teams in the world. That’s a tall order, and Chile should be proud of their performance. I completely agree. I’m not saying they *should’ve* kept it up, only that I wish they could have. I would have loved a Mexico win. And then there’s Nigeria and Algeria. These have been great games, but let’s hope that at least one underdog wins today, eh?